ThermoStream models with built-in compressors are great for temperature testing with forced air when no facility air supply is available. 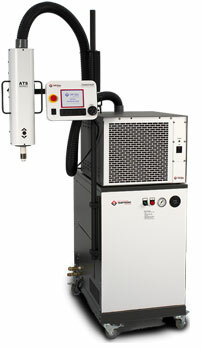 The new upgrade kit for ATS-535 and -635 models makes using a ThermoStream in lab and office environments much quieter. The kit (CS210240) allows the ThermoStream's built-in air compressor to be placed up to 50 ft. (15m) away in a remote closet or utility room. The upgrade only takes about 15 minutes to install and reduces the noise by 50% without any performance reduction.